Jesus believes that the most important thing that we can do in our lives is to love God. He makes it clear that we are not to love him just a little. Instead we are to love him with every fibre of our being. We are called to love God with all of our heart, with all of our soul, with all of our mind, and with all of our strength. How do we feel that we live up to this rule today? Sometimes, when we look at our friends we can see love radiating from them in how they speak to and act towards their loved ones. It is clear to anyone who sees them the depth of the love they have. 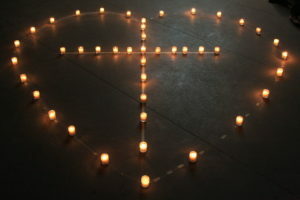 If we are Christians, then the love that we have for God should be visible to everyone we come into contact with too. When our friends, families and colleagues see us, it should be clear that our love for God is limitless. Just as we might speak lovingly about a husband or wife, or a parent, or a sibling, or a close friend, we should speak of God. Hardly an exchange should go past without us speaking fondly of our relationship with God. As we begin this new week, what challenging words for us to reflect on. Can we genuinely say that we love God with our hearts, our souls, our minds and our strength? Why not challenge yourself to spend more time with God this week so that you might deepen your relationship with the God who loved us so much that he sent his only son to die for us. This entry was posted in Bible Reflections, Thought of the Day and tagged Mark. Bookmark the permalink.